Construction on the building and remodeling project at the Paynesville Area Health Care System was delayed for two weeks while waiting for a plumber, but a replacement plumbing contractor arrived on site on Monday. Bids for the plumbing and heating and the ventilation Ð contracts totaling $1.73 million Ð were awarded to two sister companies from St. Cloud last spring. But these companies closed and did not turn up to work two weeks ago. "We heard rumors for two days," said Willie LaCroix, PAHCS administrator. "Then the plumbers just didn't show up on Monday morning." PAHCS, through its legal counsel, and E&V Consulting have been in contact with the bonding company that insures the contracts over the past two weeks to find a replacement contractor. Basically, contractors take insurance Ð called performance bonds Ð that they will complete the work. LaCroix received written confirmation of the breach of contract last week. A breach during a project is rare, something LaCroix has not encountered in 35 years of administration and five major construction projects with PAHCS. With the plumbing companies closing, their insurance company became responsible for finding a replacement contractor. PAHCS will pay the bonding company the existing contract, and the bonding company pays the new contractor. The new contractor is Allied Mechanical of Hutchinson, which was the second lowest bidder when the project was originally bid last spring. That familiarity should help the company complete the project. In addition, Allied Mechanical has hired some of the plumbers who worked on the project for six weeks for the St. Cloud companies and hired their project manager. "So there's complete familiarity with the job and what needs to be done," said Kevin Becker, project manager with E&V Consultants, who as a construction management company is coordinating the project. Had the delay lasted longer, the intricate scheduling of the project would have been in serious jeopardy. Any remodeling project requires more intricate coordination, but the nature of a hospital and nursing home Ð which can't close Ð made it more challenging yet. "Thankfully," said Becker, "this happened early enough so it wasn't an inconvenience in the guts of the facility." So far, work has focused on three additions to the facility: a new emergency room on the west side, a clinic addition to the north, and a dining room on the Koronis Manor. 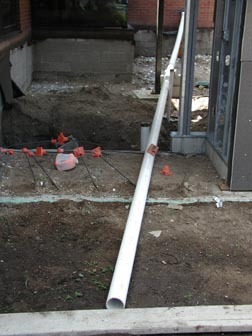 Plumbing in parts of the addition were nearly ready to be tested. The emergency room addition is particularly important. This addition needs to be completed before the fourth, and final, addition can be added. Only once the new emergency room is completed can the existing ER entrance be closed and the final addition with meeting rooms and a maintenance room be added to the north side. That addition needs to start later this fall, and the plan is to have it up, roofed, and insulated by the end of the year, which would enable work to be done inside that addition next winter, according to Becker. In the worst-case scenario before a replacement plumbing contractor was found, the completion of the ER addition this fall seemed in jeopardy, which could have had a domino effect of delaying the final addition until next spring. LaCroix estimated that the project will suffer the equivalent of a three-week delay because of the plumbing problem. "It could have been three or six months, too,"Êhe added. "When you consider what could have happened, we had a good outcome," said Becker. "I think we're in pretty good shape." Completing the final addition this fall still is realistic. "It's going to be tight, but it's doable," said LaCroix. "The thing is there can't be much problems from here on out. Things have to go well. We've lost our fudge time."